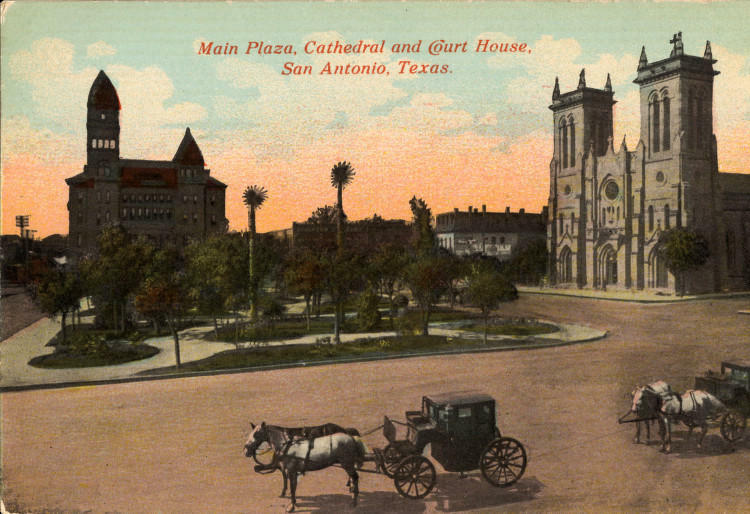 San Antonio's main plaza, cathedral, and court house. April 2, 1849: The cholera epidemic begins. The 1849 mass infection was the worst outbreak San Antonians ever witnessed. It lasted six weeks and killed at least 600 people out of a population of 5,000. The lack of a hospital was a factor in the high death rate. The Sisters of Charity of the Incarnate Word would remedy that. On Dec. 1, 1869, they opened the Santa Rosa Infirmary — it has grown into today’s Christus Santa Rosa Health System. April 3 1917: War fever hits San Antonio. A general holiday is declared in the city for the celebration of “Loyalty Day.” Three days before the U.S. enters World War I, the Alamo City is bedecked with red, white and blue. It was called “the biggest outburst of patriotism ever witnessed in a southern city.” Thousands of men, women and children lined Houston and Commerce streets for a parade of marching bands, military troops and labor organizations. Little did the celebrants know of the savage horrors that would be unleashed in the world’s first industrialized war. April 4, 1719: The Aguayo Expedition reaches San Antonio. The French invasion of East Texas forced a Spanish retreat. Marques de Aguayo was commissioned to reoccupy the area. Some members of the expedition remain while the force’s main body proceeds. In 1721, some members of the expedition return to San Antonio to establish a third mission and rebuild the Bexar Presidio. The expedition established eight missions across Texas and solidified Spain’s claim to the land. April 5, 1950: Two Air Force pilots chase a bright object in the sky from Austin to San Antonio. At 1:45 p.m., fighter pilots were scrambled from Bergstrom Air Force Base and ordered into the air. The two pilots climbed to 40,000 feet while in pursuit of the unidentified flying object and kept the bogey in sight for 30 minutes. They reported the object didn’t seem to be an aircraft or any flying machine. After reaching San Antonio, the pilots broke off the chase. They concluded they were probably chasing a planet — likely Venus. April 9, 1976: President Gerald Ford visits San Antonio during his presidential election campaign and was given a plate of tamales. He picked one up and, without removing the corn husk, bit right into it — and the “Great Tamale Incident” was born. Veteran CBS correspondent Bob Schieffer recalls that Ford “nearly choked.” Mike Huckabee, a former republican presidential candidate, said the tamale blunder became a media focal point. Texans found it too hard swallow that Ford fumbled the tamale test. Huckabee said it cost him Texas and Democrat Jimmy Carter won the White House. April 10, 1939: The first issue of the San Antonio Register is published. Focusing on issues important to African Americans, the weekly newspaper was produced for 47 years without interruption. The Register was founded by Charles Bellinger, a San Antonio black political boss, when the San Antonio Inquirer refused to publish his political ad. Three years later, the Inquirer folded. The Register was widely circulated across the South. It reported on the lynchings and other horrors of Jim Crow violence that were routinely ignored by white newspapers. April 12, 1793: The mission San Antonio de Valero is secularized. The land and livestock are surrendered by the church. Under Spanish rule, administrative justicias were appointed to divide mission property with the intention of protecting the best interest of the indigenous mission people. It would be 30 years later that the other four San Antonio missions were secularized. But soon after the mission de Valero closed, a company of Spanish Calvary called the Flying Company of San Carlos de Parras arrived and established it as a fort. They were likely the first to call the complex the Alamo. April 13, 1709: A Spanish expedition reaches the site that is now San Antonio and came upon a natural artesian well. The expedition led by Father Antonio de San Buenaventura de Olivares, and accompanied by Father Isidro Felix de Espinosa who wrote, “After going through a mesquite flat and some oak groves, we came to an irrigation ditch, bordered by many trees and with enough water to supply a town.” “It” being the feast day of St. Peter — they named it San Pedro Springs. April 16, 1852: San Antonio passes its first ordinance targeting slaves. It was a curfew. Slaves had to be in their homes by 9:30 p.m. Any slaves caught in the street after the curfew bell rang would be apprehended and kept in the “calaboose” until the master paid a $5 fine or the slave could work off the fine in servitude to the city or the slave could pay by being whipped. The ordinance was later amended to prohibit slaves from possessing alcohol, being able to sell anything and carrying weapons. April 17, 1776: María Josefa Granados marries Fernando Veramendi. The 17-year old Granados was a descendant of the first conquerors and rulers of the Canary Islands, and her family was held in high regard in the society of the villa of San Fernando de Béxar. The 33-year-old Veramendi was a merchant. The blessed union created a social and economic powerhouse that aided in establishing San Antonio as a center of commerce in the frontier. In 1783, Don Fernando was killed by Apache while on a trip to Mexico City. The widowed Doña María Josefa continued to operate the largest general store in San Antonio. April 18 1842: Juan Seguin resigns as mayor of San Antonio. Born in San Antonio to a prominent family Seguin fought in the Texas Revolution. He escaped death at the Alamo when he was sent out as a courier. Seguin was elected to the Republic of Texas Senate, and was elected mayor of San Antonio. But his time in office was controversial. Anglo squatters on city property invented rumors accusing him of betraying Texas to Mexico. Fearing for his life, Sequin resigned and fled with his family to Mexico. He fought against the invading U.S. in the Mexican War. April 19, 1957: San Antonio oilman and adventurer Tom Slick is quoted as saying that his exploring party in the Himalayas found three sets of mysterious tracks, which he was convinced were made by the fabled “abominable snowman.” Slick was active in cryptozoology and sought to prove the existence of Bigfoot, the yeti and the Loch Ness Monster. Slick founded several legitimate research organizations, including Texas Biomedical Research Institute, the Southwest Research Institute and the Mind Science Foundation. 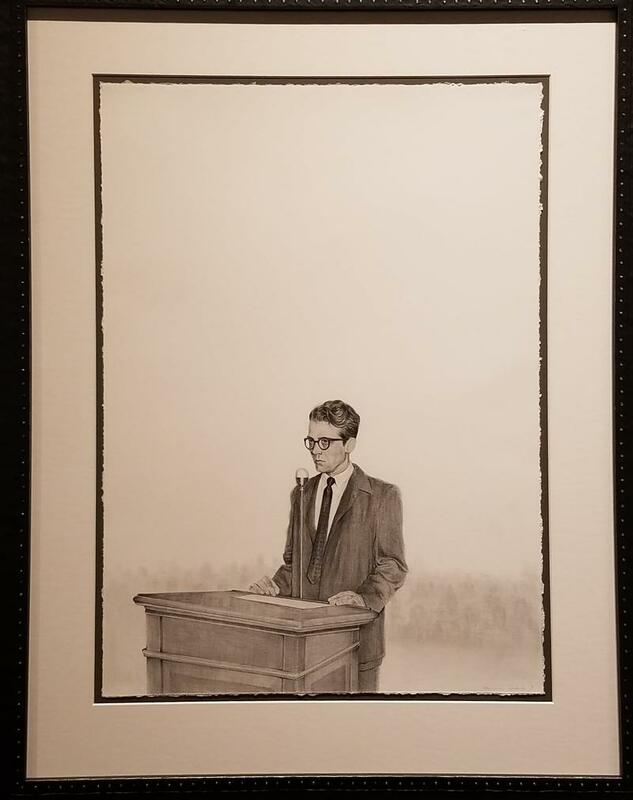 He was an advocate for global harmony and his legacy continues to fund scholarship in world peace. April 20, 1923: A fiery tragedy at Fiesta. Two San Antonio firefighters are killed and 11 are injured when an 82 foot tall planned bonfire prematurely ignited. The wooden structure was constructed, stuffed with hay and soaked with gasoline. The firefighters had planned to stage an exhibition of their rescue skills as a fundraiser. It was to be the highlight for the 1923 Fiesta. But when the rescue dummy fell off the top platform two firefighters climbed the structure to set it up right. However, that’s when the tower unexpectedly caught fire. April 23, 1861: United States Army officers from the 8th U.S. Infantry stationed in San Antonio are seized as prisoners of war. It was the early days of the Civil War and the Confederacy’s attack on Fort Sumter had happened two weeks earlier. The Union officers are quickly offered pardons which they accept under protest. After signing documents and pledging not to do harm to the Confederacy, the officers were allowed to go home. But before leaving, two soldiers secretly took the regimental and American flags which had been carried in the Mexican War and returned them to Washington D.C.
April 24, 1891: The first Battle of Flowers Parade takes place. The parade was to celebrate the anniversary of the victory at San Jacinto and was scheduled to coincide with the visit of President Benjamin Harrison. However, rain forced a four day delay. Then, with clear skies but without Harrison, the parade went on. At its conclusion, women celebrated by throwing flowers at each other. On April 24, 1948, the first Fiesta Flambeau parade was held but on its debut it was called simply the Fiesta Night Illuminated Parade. 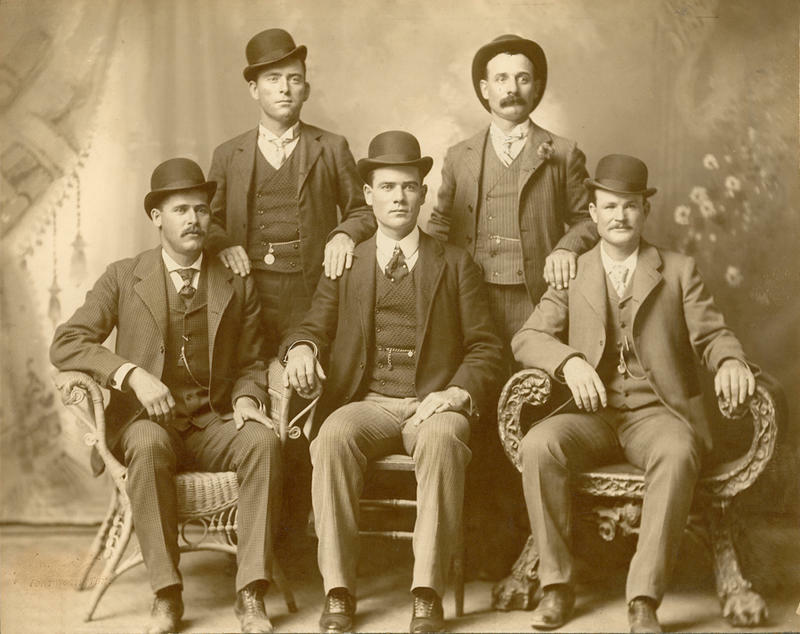 April 25, 1885: The annual newsmen shooting contest was held at San Pedro Springs, where the marksmanship of San Antonio’s newspaper reporters was put on exhibition. To determine who was the shootist supreme, each contestant was issued 10 glass balls for targets. Of the six entries, Light reporter, M. H. Claytor had the truest aim and was rewarded with the prize of a shotgun presented by the Alamo Gun Club. There were no injuries except for one reporter’s dental filling, which was knocked out of his molar by the gun’s recoil. April 26, 1914: More than 50 San Antonians of Mexican descent send a telegram to President Woodrow Wilson, offering him their services if war breaks out with Mexico. A spokesperson for the group said more than 100 Texas-Mexicans were ready to shoulder a military rifle should the occasion require. Relations between the U.S. and Mexico were at the breaking point and the Tampico Affair nearly triggered a full war. Earlier that month, the Navy shelled and occupied the city of Veracruz. While some in the U.S. called for a full occupation of Mexico, Wilson limited the invasion to Veracruz. April 27, 1979: A sniper at the Battle of Flowers. Ira Attebury parked his motor home along the parade route at East Grayson and Broadway. A 64-year old Attebury suffered from paranoia and had a horde of weapons in his trailer. For 30 minutes, he fired into the crowd. Two women died, and 17 people suffered serious wounds, including five police officers. After a gun battle with police, Attebury died from a self-inflicted gunshot to the head. Had it not been for an SAPD officer who bravely drove his police car in front of Attebury’s field of view, the tragedy would have been much worse.